In spite of clichéd star-crossed love story, superb performances and an amazing eye for detailing entertain us. We know how Salim-Anarkali fell in love. We know how Veeru wooed Basanti. We know how Raj-Rashmi of ‘QSQT’ and Prem-Suman of ‘Maine Pyar Kiya’ rebelled against their families. We fell in love with Raj-Simran, Geet-Aditya or Kabir-Naina. These great love stories of Bollywood had set in glossy locations from Ooty, Manali to Europe. Most of the characters came from rich upper-middle-class families. But ever wondered when a young man who runs a public toilet and a girl who works as a maid fall in love with each other what would their love story be like? Where do they meet, how do they fantasize, where do they sing love songs? Mostly we haven’t. But writer-director Krishnadev Yagnik has. Yes, he is the same brain behind the most successful movie of Gujarati cinema, ‘Chhello Divas.’ It was a runaway hit. Nobody had a clue in their wildest of dreams that a movie with a bunch of college friends fooling around could be a trendsetter, even without a proper story! Krishnadev Yagnik aka ‘KD’ as he is known among friends, tried his luck in Bollywood with the same story and remade it as ‘Days Of Tafree.’ It sank without a trace. Now he is here again. With his new movie with a naughty name ‘Karsandas Pay And Use’ (pun intended). ‘Naresh’ of ‘Chhello Divas’ is here in the main lead. And the movie has set in, yes, a public toilet! Tilok (Mayur Chauhan aka Michael) & his younger brother Sundar (Hemang Shah) are caretakers of a pay and use public toilet. Tilok falls in love with Jaya (Deeksha Joshi) who comes to use the toilet. Jaya lives nearby and she is a maidservant. Soon their dream sequence gets over and brutal reality hits on Tilok’s head, quite literally. Jaya’s hot head father Chinubha (Chetan Daiya), a rickshaw driver, is strongly against this affair, as Tilok is from so called low caste and he’s on the upper berth of the social pyramid. The couple in love didn’t even realize that there’s an invisible but thick ages old wall between them. The wall of caste, social stigma, and money. But Tilok is in no mood to succumb to any social pressure. As the movie says he only believes in ‘Prem nu pressure’ (the pressure of love). He openly challenges the girl’s father, he’ll show his worth and will earn one rupee more than him. Please take note that he’ll do all these in thirty days only. What will he do? Well, Tilok is waiting in theaters near you. Jaya slips and Tilok saves her in his arms, but she slips on the wet floor of the toilet. Their hands touch for the first time over an exchange of a tumbler. During their dream-walk not rose petals, but onion peels fall on them. They go on a date to watch a movie of Vikram (Thakor), reigning superstar of Gujarati single screen cinema. Tilok swings on a scooter tyre and Jaya sees the glow of her smitten face in a stainless still thali she’s washing. All these things are sheer joy to watch. Not only the love story but look of all characters, dialect & tone in which they speak, their friendship, their daily struggle, the stigma they face, are all carved with great detail. Notice how Tilok roams like a lion in his own territory, i.e. the public toilet. How his friend Kalubha (Jay Bhatt) puts the first puri of the day under a wheel of his hand cart. How a man who can send his heavily pregnant wife to a public toilet, but he himself wouldn’t put his hand into his own toilet commode to pull out a glass stuck into it. Contrary to what we think, Tilok is never apologetic or ashamed about his work. He may be earning too little but he hasn’t given up on his dreams. He is full of swagger. Michael has perfectly reflected this I-am-the-king-of-my-world attitude of Tilok. Director and cinematographer (Bibhu Das) love showing his tight close-ups and his walks in slow-motion. Mayur’s terrific performance is equally supported by three other actors. First is Sundar (Hemang Shah), his friend Kalubha (Jay Bhatt) and the antagonist Chinubha (Chetan Daiya). Hemang, though overacts sometimes, but has superb comic timing and keeps lighter tone flowing even in very intense scenes. We can feel the warmth among first three. On the other hand always in bad temper Chetan Daiya is frightening. He keeps us in constant fear whom he’ll hit now. Love interest of Tilok, actor Deeksha Joshi has captured all nuances of her character, but she doesn’t have much substantial to do in the film. The movie has two songs, ‘aai jyo’ and ‘mane kahi de’, are already hit. But both are overused in the movie. Music by Kedar-Bhargav reminds of some A. R. Rahman songs and other Tamil hits like the title song of Dhanush starrer ‘Maari’. This film could have been path breaking, had it been written better. The love story in the first half eats up more time. But the real problem lies in the second half. Technics used by Tilok to prove himself are not unique and makes the movie just farce. It just doesn’t give the feel of dramatic climax. Things just fall into place in a convenient way. Three long monologs are entertaining, but almost feel alien to the main flow of the movie. Two of them are just stand up acts. The third one is only preaching. Slow pace and length feel tiresome at some places. In spite of having a toilet at the center of the movie, they haven’t shown a single shot of it! It has some toilet humor, but never goes below the belt, which was the case with ‘Chhello Divas.’ This is a clean comedy. 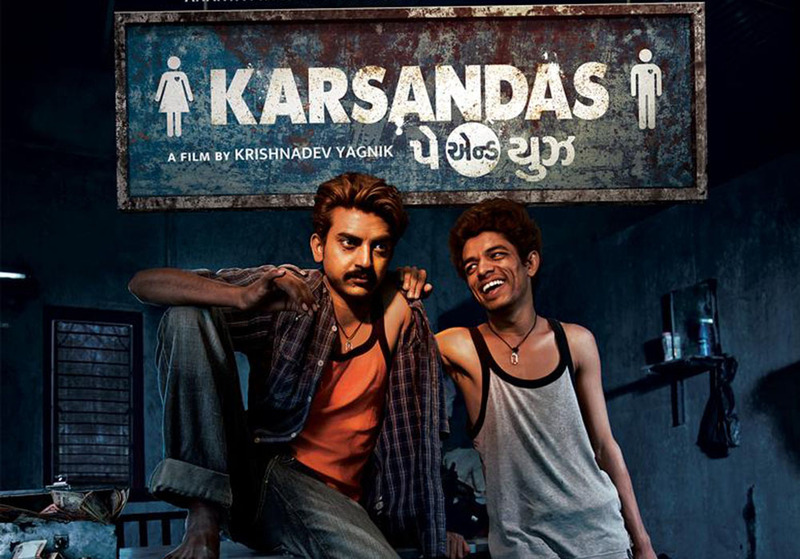 ‘Karsandas Pay And Use’ is far from a perfect film, but it constantly entertains you. It even triggers some thoughts as well. This is no ‘Sairat’, a huge Marathi hit with the same premise. But still give this movie a try, with family. You won’t be disappointed.